This is a delightful and award winning book. Full of fun and language play, it’s a perfect entry to the world of poetry and rhyme. Very young children will want to hear, and repeat these contemporary rhymes again and again, just as they can with traditional nursery rhymes. There’s lots which will resonate with young children and their parents as many of the poems tap into familiar feelings and experiences; being excited about a party in Party Time, feeling anxious in Lost, being told what to do in Are you Listening? or wanting to have a go at something in Let me do it. 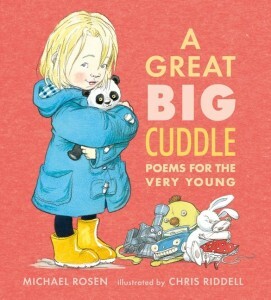 This is an inspired collaboration between two of our Lovemybooks’ patrons; a great poet, Michael Rosen, and a great illustrator, Chris Riddell, with joyous results. You could read the poems in order or browse and dip into the book, stopping to share the pages that take your fancy. Children will develop their own favourites (and so will you!) and enjoy hearing you reading them again and again. Encourage children to join in with the words and actions and perhaps with completing the rhymes. I don’t want, Oh Dear and Let Me Do It are just three of the poems with repeated lines or choruses which would be great fun for children to join in with. The illustrations are absolutely delightful and children will enjoy looking at them and talking about them. Which are their favourite pages? Recite The Button Bop when you are buttoning up clothes. Dance to Tippy-Tappy and Music. After sharing Boing Boing children can try to roll up like a ball or pounce like a tiger. Wiggly Wiggly will encourage lots of delightful wiggling, jiggling and giggling. Finger story will encourage finger play and thinking together what fingers can do. Practise counting down together with Party Time. At mealtime you can repeat the words of Lunchtime, crunching and munching. In I AM HUNGRY you can have fun together talking about all the things you’d eat if you were really hungry, or what makes you really angry in I AM ANGRY. Can children make a really angry face? With Once they can enjoy looking scary like a terrible ‘Berrible’ perhaps looking at their faces in a mirror! Children might like to draw their own picture of a terrible Berrible. Walker and Booktrust have produced some downloadable activity sheets on this book. Chris Riddell has illustrated many children’s books and is author and illustrator of the Ottoline and Goth Girl series. See our activity ideas for Ottoline and the Yellow Cat here.